Four bedroom detached cottage which has sympathetically been extended sitting in a uniquely stunning location offering spectacular views over towards the Holyhead Breakwater and beyond. 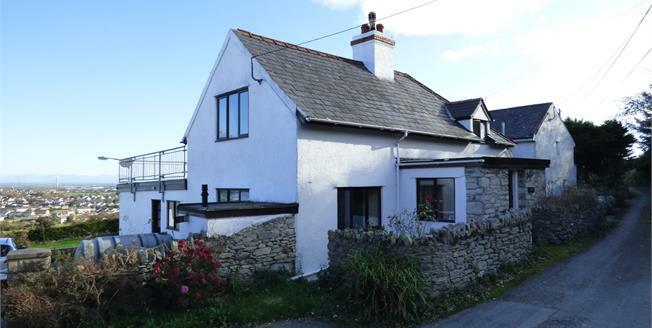 Internally the property briefly comprises of three ground floor bedrooms, family bathroom, utility, kitchen/breakfast room offering fabulous sea views and separate dining room with cosy inglenook and solid wood parquet flooring. The first floor offers a second bathroom, double bedroom and the main feature of the property - a spacious lounge with doors opening onto an impressive roof terrace with breathtaking views. UPVC sliding double glazed door, opening onto the garden. Radiator, tiled flooring, ceiling light. Fitted units, one and a half bowl sink, electric oven, gas hob, over hob extractor. Double glazed wood window. Radiator and open fire, parquet style flooring, beam ceiling, ceiling light. UPVC sliding double glazed door, opening onto a balcony. Double glazed wood window. Radiator and open fire, ceiling light. Double glazed wood window overlooking the garden. Radiator, ceiling light. Double aspect double glazed wood windows. Radiator, ceiling light. Double glazed wood window. Radiator, built-in storage cupboard, ceiling light. Tiled flooring, ceiling light. Space for dishwasher, space for washing machine, dryer, fridge/freezer. Wooden front . Double glazed wood window. Radiator, ceiling light. Double glazed wood window with frosted glass. Heated towel rail, tiled flooring, ceiling light. Standard WC, walk-in shower and corner shower, pedestal sink. Double glazed wood window. Radiator, ceiling light. Standard WC, panelled bath, vanity unit and wash hand basin.